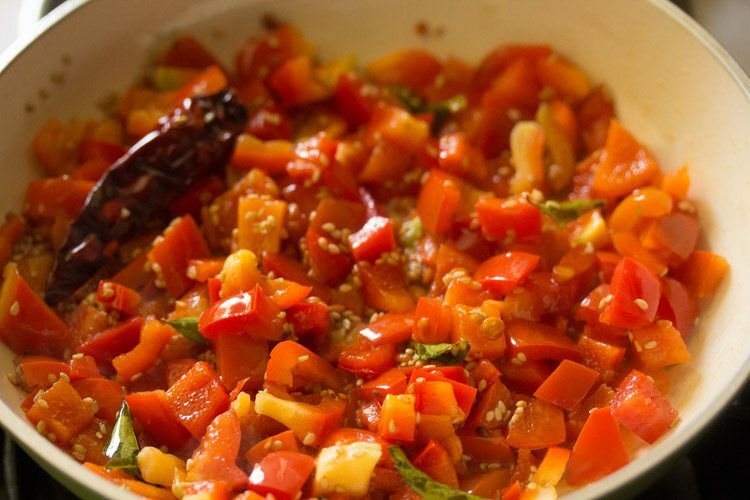 capsicum chutney - healthy chutney made with red capsicum or red bell peppers. 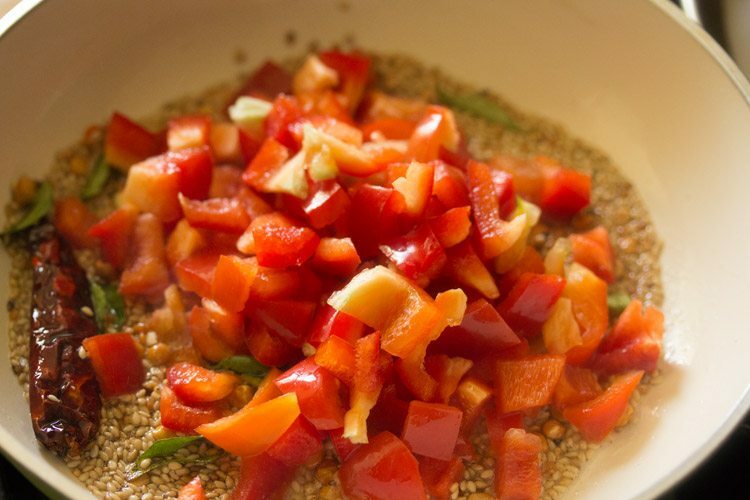 capsicum chutney recipe with step by step photos – nutritious chutney recipe made with red capsicum or red bell peppers. you can make this chutney with green or yellow capsicum also but the taste will be different. when i make south indian breakfast or snacks like medu vada, rava uttapam, punugulu, mysore bajji, cabbage vada, oats dosa etc then to go along with them i try to prepare chutneys with various veggies. so whenever i prepare a veggie based chutney, if possible i do take pics so that i can share the recipe with you guys. 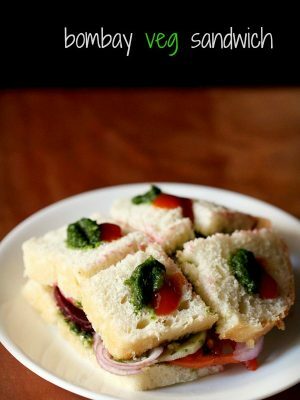 this capsicum chutney tastes very good and if you like capsicum, you will like this chutney recipe too. i served it with akki roti, but even with idli or dosa the chutney tastes good. you can even have it with plain steamed rice. 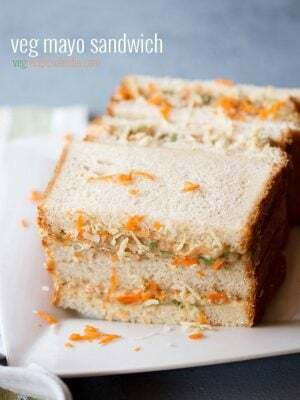 you can also serve it with south indian snacks like uttapam, idli fry, ulundu vada, rava dosa and rava idli. heat a pan and keep the flame to a low. add 1 tablespoon sesame oil. 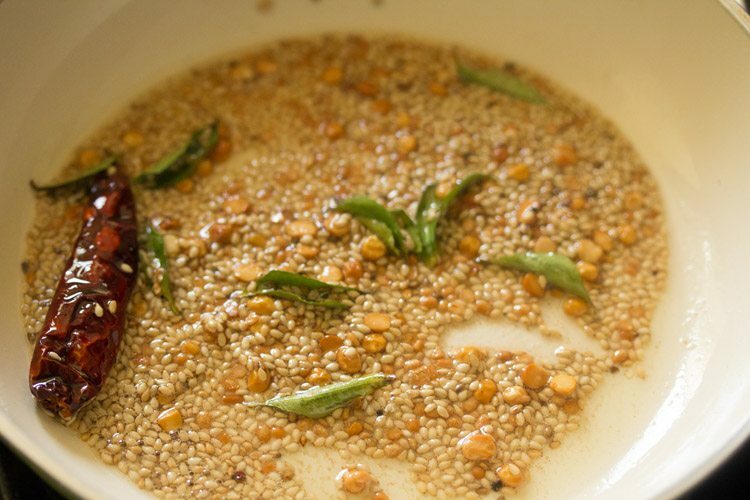 when the oil becomes hot, add 1 teaspoon urad dal and 1 teaspoon chana dal. on a low flame stirring often saute both the dals, till they turn golden. make sure not to burn them. 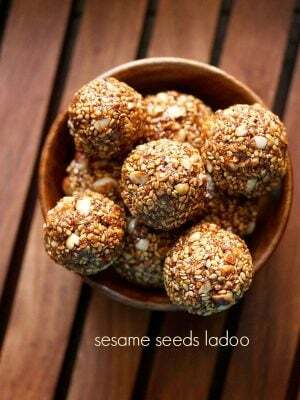 then add 1 tablespoon sesame seeds. 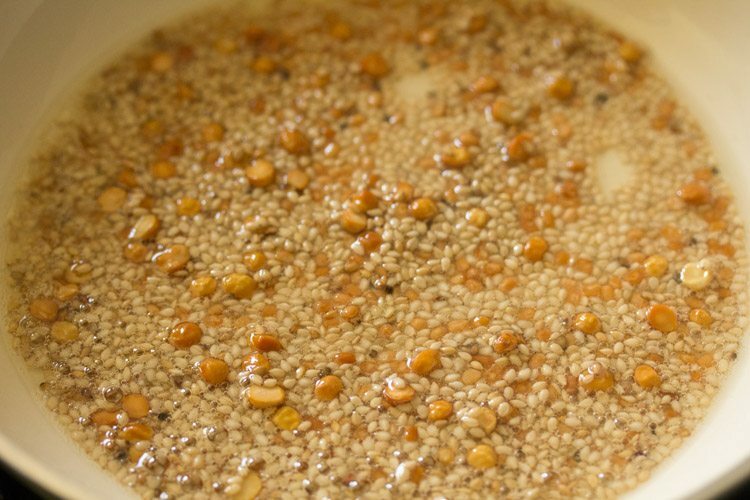 mix and saute till the sesame seeds start crackling. then add 1 red chili, 6 to 7 curry leaves and 1 pinch of asafoetida (hing). next add 1.5 cups chopped red capsicum (shimla mirch). mix well. add salt. mix again and saute capsicum on a low flame. saute capsicum till they soften for about 6 to 7 minutes on a low flame. then add ¼ cup desiccated coconut and ½ teaspoon tamarind. you can also add fresh coconut instead of desiccated coconut. 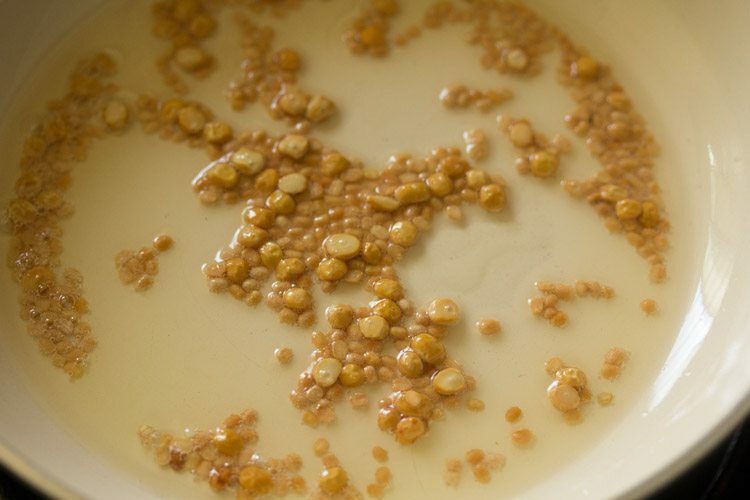 a bit of sugar or jaggery can also be added. you can also add 1 tablespoon roasted peanuts. let the mixture become warm or cool down at room temperature. then add it in a grinder jar along with ⅓ cup water. 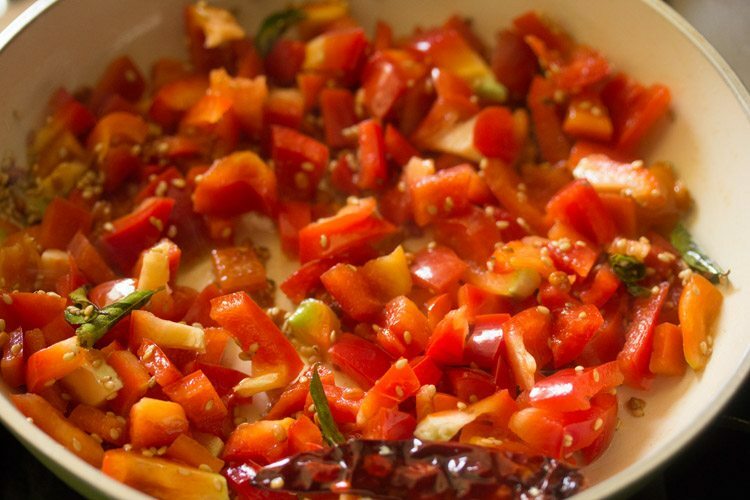 remove the capsicum chutney in a bowl. scrape of the sides and bottom of the grinder jar and add the remaining chutney in the same bowl. if you want, you can even add some water and then swirl the jar. this way the capsicum chutney at the bottom and sides of the jar gets mixed with the water. 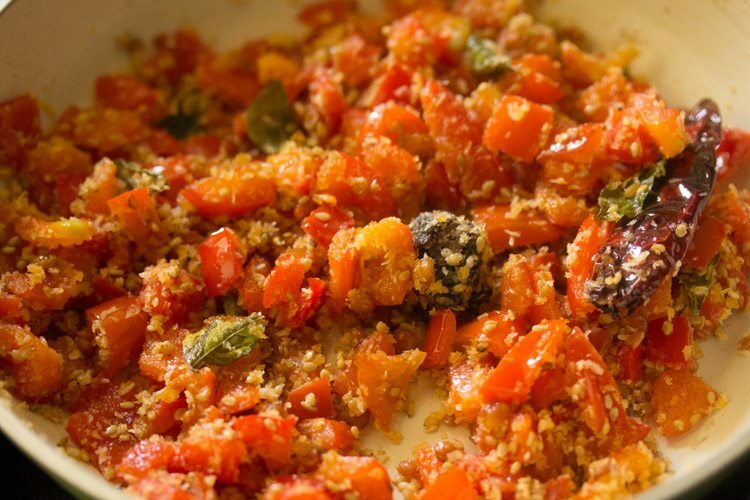 but do note that not to add too much water as then the capsicum chutney will become thin. 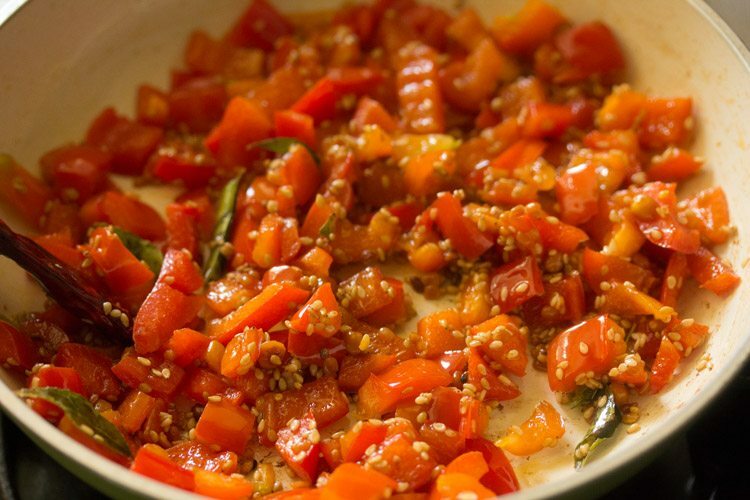 heat 2 teaspoons sesame oil in the same pan and add ½ teaspoon mustard seeds. 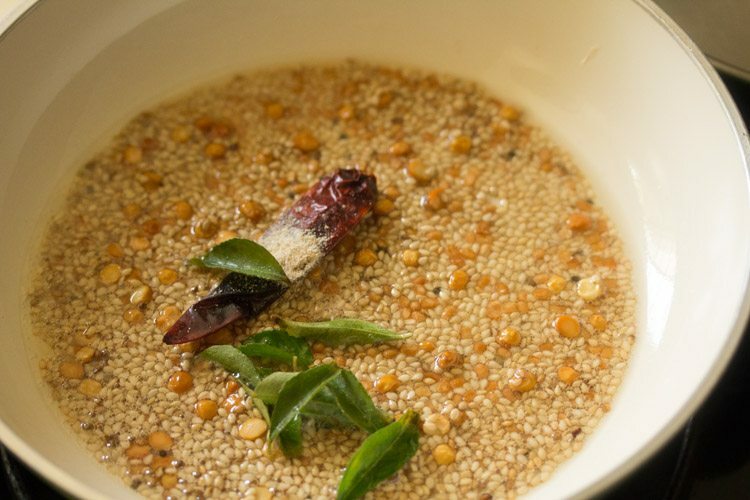 once the mustard seeds crackle, add 4 to 5 curry leaves. mix and stir. 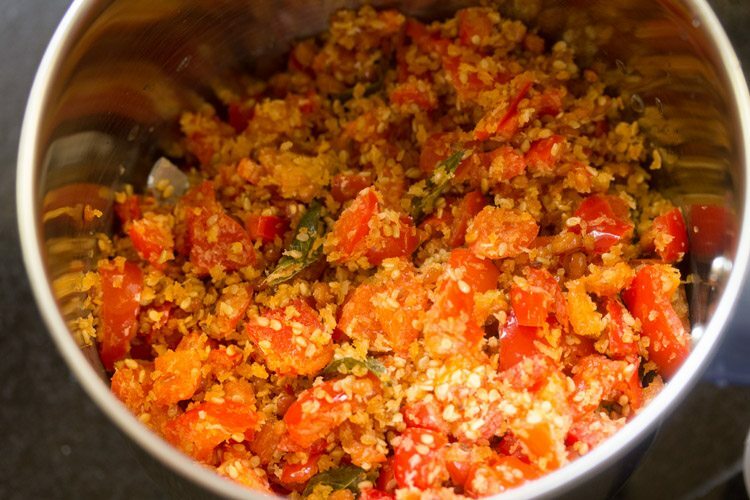 pour all of the tempering in the capsicum chutney. mix well. 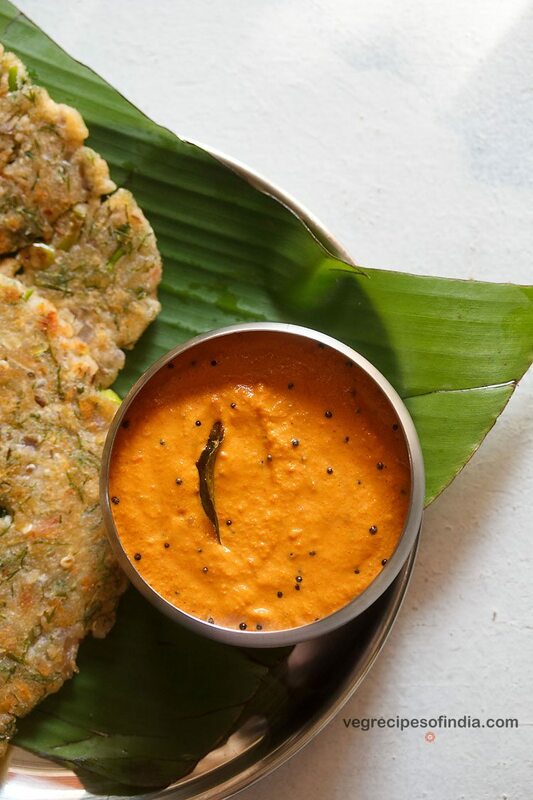 serve capsicum chutney with idli, dosa, adai or vada or steamed rice. 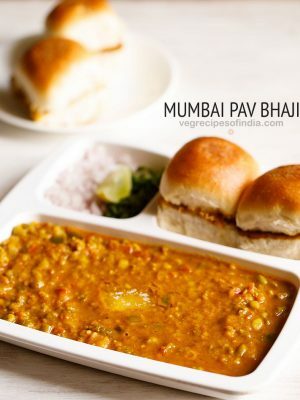 you can also serve this capsicum chutney with akki roti. 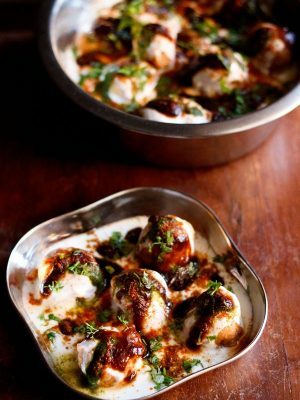 leftover chutney can be refrigerated and it stays good for 4 to 5 days. 1. heat a pan and keep the flame to a low. add 1 tablespoon oil. 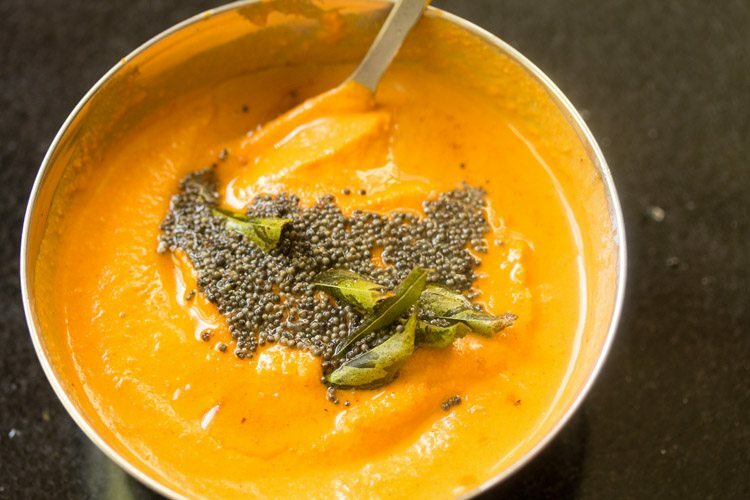 when the oil becomes hot, add 1 teaspoon urad dal and 1 teaspoon chana dal. 2. on a low flame stirring often saute both the dals, till they turn golden. make sure not to burn them. 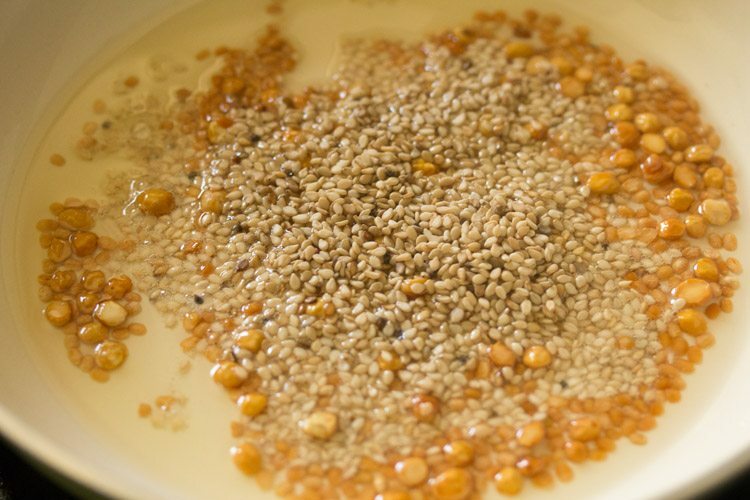 3. then add 1 tablespoon sesame seeds. 4. mix and saute till the sesame seeds start crackling. 5. then add 1 dry red chili, 6 to 7 curry leaves and 1 pinch of asafoetida (hing). 7. next add 1.5 cups chopped red capsicum. 10. mix again and saute capsicum on a low flame. 11. saute capsicum till they soften for about 6 to 7 minutes on a low flame. 12. then add ¼ cup desiccated coconut and ½ teaspoon tamarind. you can also add fresh coconut instead of desiccated coconut. a bit of sugar or jaggery can also be added. 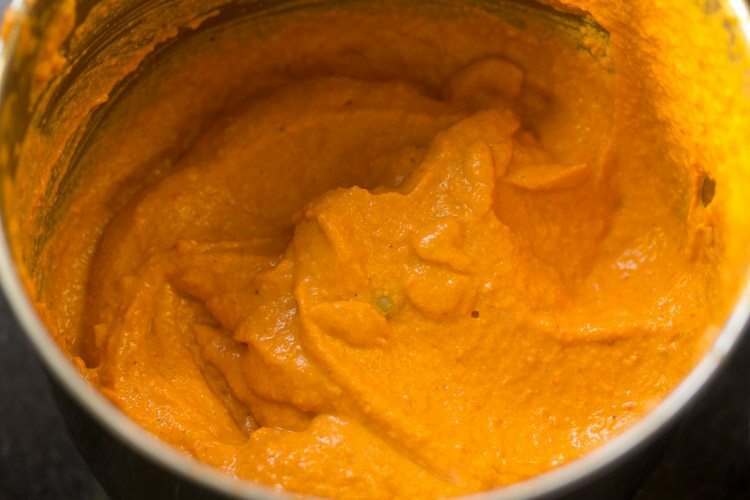 you can also add 1 tablespoon roasted peanuts. 13. mix very well and switch off the flame. 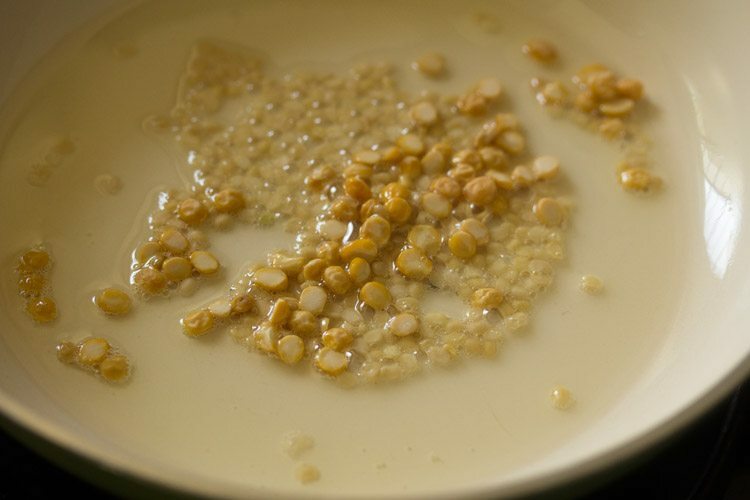 14. let the mixture become warm or cool down at room temperature. then add it in a grinder jar along with ⅓ cup water. 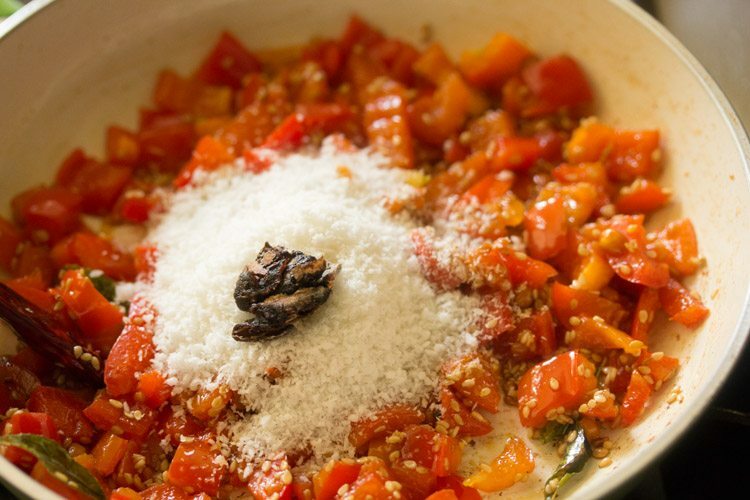 16. remove the capsicum chutney in a bowl. scrape of the sides and bottom of the grinder jar and add the remaining chutney in the same bowl. if you want, you can even add some water and then swirl the jar. this way the capsicum chutney at the bottom and sides of the jar gets mixed with the water. 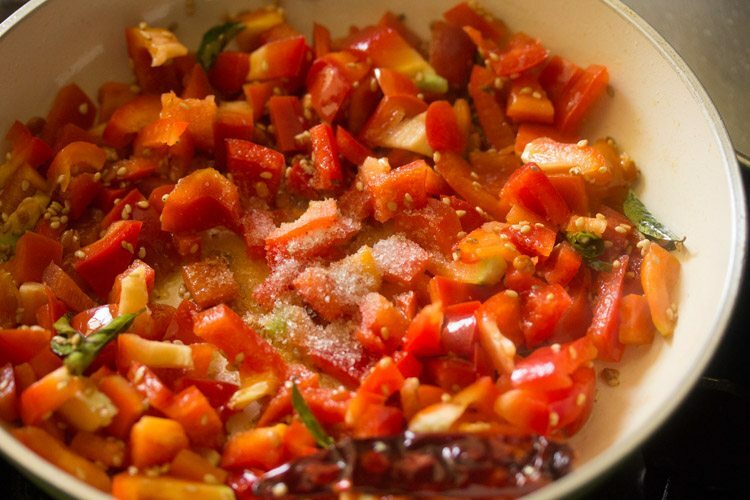 but do note that not to add too much water as then the capsicum chutney will become thin. 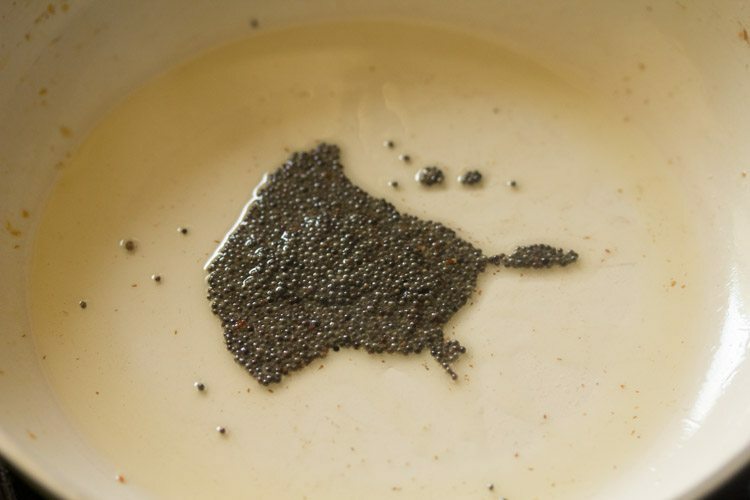 17. heat 2 teaspoons oil in the same pan and add ½ teaspoon mustard seeds. 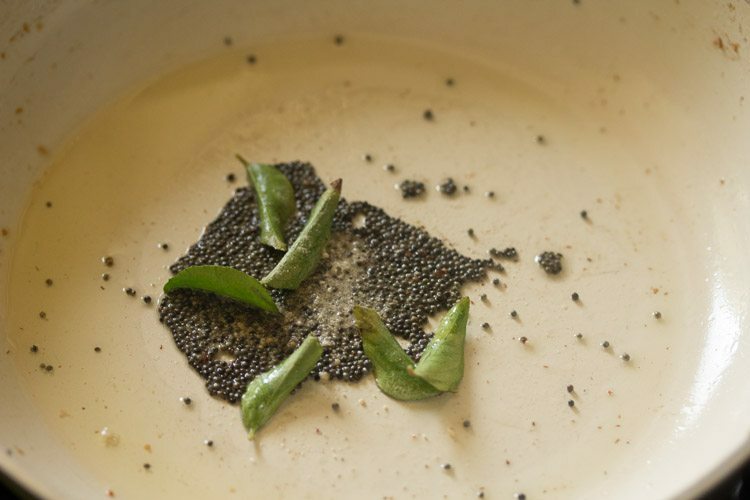 18. once the mustard seeds crackle, add 4 to 5 curry leaves. mix and stir. 19. pour all of the tempering in the capsicum chutney. mix well. 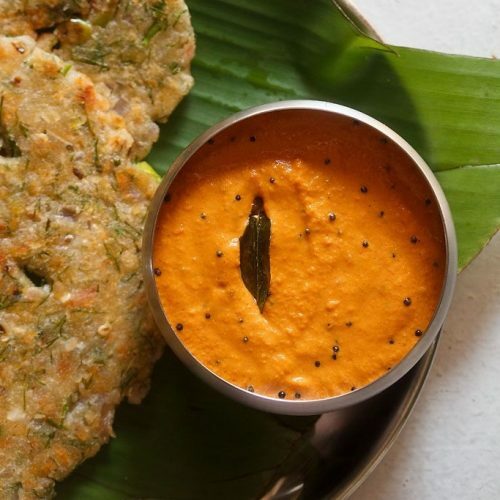 20. serve capsicum chutney with idli, dosa, adai or vada or steamed rice. 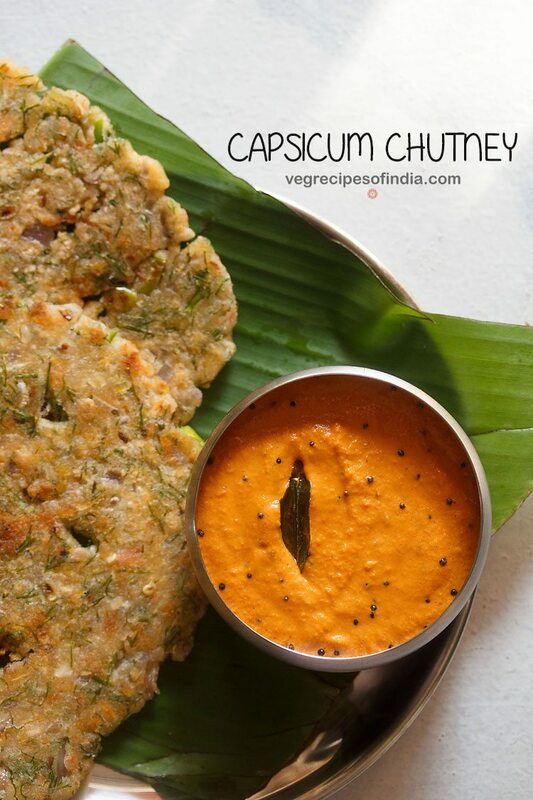 you can also serve this capsicum chutney with akki roti. 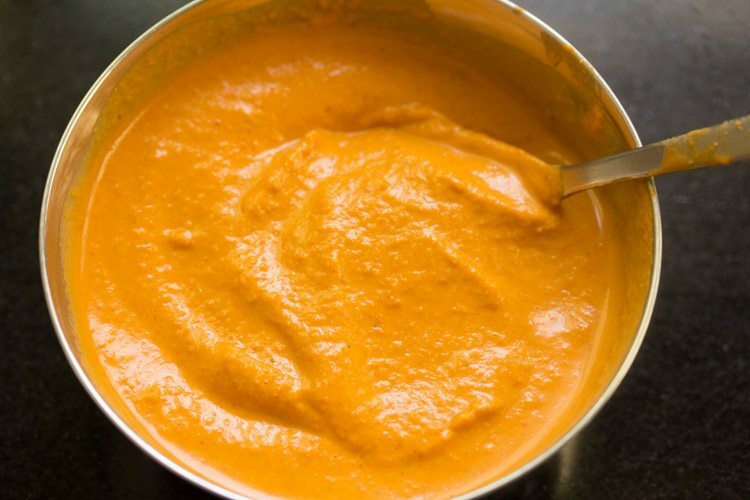 leftover chutney can be refrigerated and it stays good for 4 to 5 days. Hi Dassana tried making capsicum chutney. It was really good. We liked it .Thank you. Can we try this chutney with green capsicum? thanks josline for this positive feedback on capsicum chutney recipe. 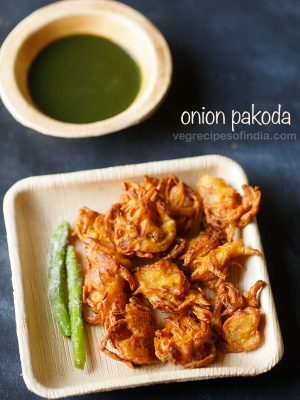 you can make with green capsicum also, but the taste will be different. 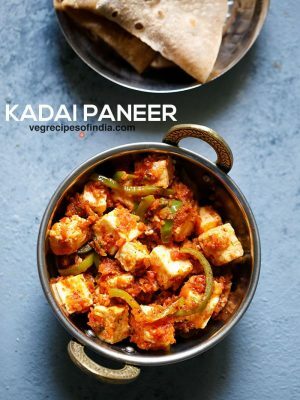 Hey dassana , you mentioned akki roti in this recipe , but I could not find akki roti recipe on your website. preethi, i plan to add akki roti recipe soon. not yet shared the recipe.